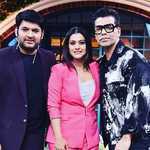 CHANDIGARH: Recently, pictures of Karan Johar and Kajol from the sets of ‘The Kapil Sharma Show’ surfaced on the internet. While Kajol looked pretty in pink, Karan was seen sporting his signature style and printed jackets. Comedian Sunil Grover to join ‘The Kapil Sharma Show’ in June? The Anti-Terrorist Squad of the Maharashtra Police which arrested seven people from Kalyan railway station and Vikhroli near Mumbai on Saturday claimed that they were Naxalites who may have been involved in the recent violence by Dalits across the state. According to the police, those arrested, included Ajay Dosri alias Krishna Lingaya, who also goes by the name of Venugopal, a District Committee Secretary of the banned Communist Party of India-Maoist. Dosri was active in various cities of Maharashtra where he allegedly worked among the overground members of the outfit, according to the police. The Telengana Government has reportedly set a reward of Rs 8 lakh for his capture. All the seven have been sent to police custody by the magistrate’s court till January 17. Sources said today that the police have discovered posters on the Bhima Koregaon incident where Dalits returning from the bi-centennial celebrations marking the defeat of the Brahmin Peshwa army in Pune in 1818 were attacked. The attacks sparked off a violent bandh in most cities of Maharashtra. Police say the arrested naxalites were active in many slum pockets in and around Mumbai where they were allegedly recruiting disaffected youths to join the Maoists. They were also collecting funds from sympathisers in urban areas, according to police.